Reference Monitors and Why They Almost Don’t Matter! It has been over two years since I purchased my first set of Studio Reference Monitors. A Pair of M Audio BX8 D2 monitors arrived in a huge box complete with some little vibration damping pads, and another box containing the stands I got with them as a package deal. I Paid a little over £400 and the main reason I went for them was the price point and good reviews. I’m not going to go into all the features but rather I’d like to take this as my opportunity to give you an invaluable piece of advice. Before we get to that, lets talk a little about the testing environment, or rather my living room studio. 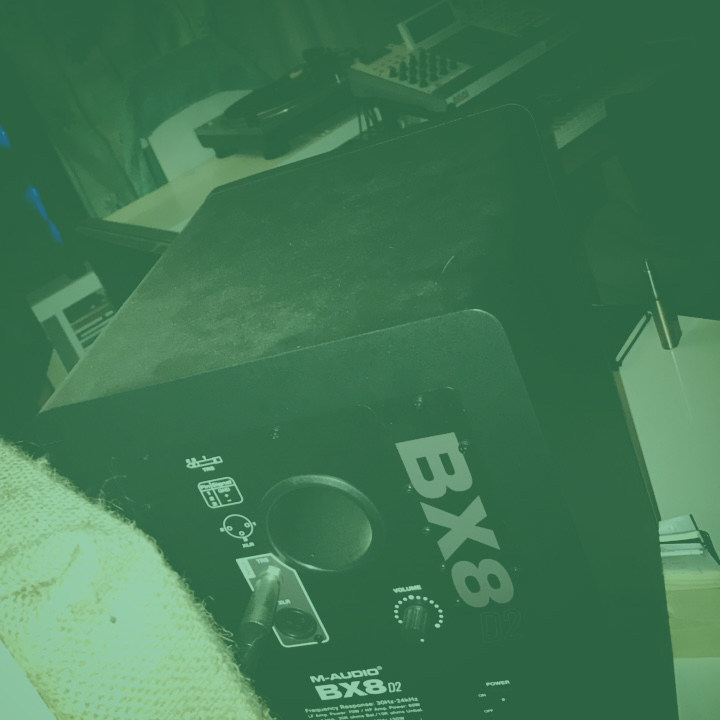 My studio consists of a central 27″ monitor on a large desk, with my audio interface within easy reach on the right, my midi keyboard and MPC to the right of my chair, and the M audio BX8 D2 sitting in front of me spaced 3 feet apart. I sit 3 feet from the face of each monitor to equate the distance apart, with ears level with the tweeters thus giving me the recommended position by the manufacturer. The wall behind my speakers is treated with 2″ thick sound absorbing fiberglass and porous fabric panels. The wall behind me has a curtained window but to each side is a 4″ thick 2’x4′ panel (bass trap). To each side the nearest reflective wall is around 7 feet, with various 2″ thick panels dotted around. The floor is carpeted, the ceiling is bare. Not exactly Abbey Road, but significantly better than an untreated room. The reason the space matters is because sound is an organic thing. Sound doesn’t just go from the Studio Monitors to your ear. Sound fills your room, and you perceive that sound the best you can, taking in all the reflections and natural reverberations that happen as the sound bounces around. Now lets take a look at our own situation. Are we starting out learning to mix music, or are we buying these as an addition to a studio? Are we going to be mostly working on these speakers or split our time between our own studio and a much more well equipped one? Why does it matter? We’ve now reached the purpose of this article. None of this matters! The point of a reference monitor is to refer to it when checking to see how your mix sounds. In that moment you are comparing your mix to your brains idea of a good mix. The more you listen to a good mix in actuality, the better idea your brain will have of what that sounds like. The caveat here is that unless your listening to that “good mix” on the same Studio Monitors, you are trying to achieve the sound of another pair of speakers in another environment. Lets say you wanted your rock song to have the same tonal qualities and same dynamics as the latest Foo Fighters single. The best thing you could ever do is load that Single up in your DAW and compare the mixes on the same sets of speakers. Listen to both in quick succession on earbuds, then on a mono cube speaker. Go listen on headphones, then on your iPhone, then in the car, then on your monitors. Note down the differences, and don’t be afraid to listen to both tracks on regular hi-fi speakers and audio units with “improved bass response”. Then load up a visual EQ plugin and try to confirm those notes you made. Look at the differences in the audio spectrum and how much information is contained within each frequency. As you do this more and more, this becomes your method of referencing. No matter what reference monitors you have, you have checked how the song will act in different environments, and all being well you will have dialled in the mix to where it needs to be . Now comes the kicker. You may be asking yourself why there are reference monitors to be had from as little as £100 right up to the many thousands of pounds for extremely high end technology. Well, as much as the method above works for generally getting your sound to the right ballpark area, reference monitors have a major benefit. All the little nuances and fine adjustments that you do when sound designing or using High and Low Pass Filters are much more pronounced and recognizable in speakers of a higher quality. Studio Reference Monitors are designed to expose everything, whereas speakers are designed to be a pleasant listening experience. If there’s anything a little problematic, you need to be able to hear it. Of course the more you spend, the more apparent these problems become. “So should I buy these things or not?” you’re probably asking. The answer is yes, if you’re considering these then you obviously have a budget. The M Audio BX8 D2 have been invaluable in my journey of learning to mix music. In Fact I’d probably be writing this exact same article about almost any pair of studio reference monitors that I have lived with for this long. Buy an appropriate size set of reference monitors for your studio, do the best job of sound treating your room that you can afford, and have multiple references and a willingness to learn. Just get some decent monitors and start to train your ears and your brain. I echo my previous blog post here, Time is the Audio Engineers Greatest Teacher.